My friend John is a serious Worm Inn fan. Back in the fall, he upgraded from the standard model to the Worm Inn Mega. Bigger system, more worms, more processing power…but also more trouble if something “goes wrong”! In John’s case, this came in the form of a fruit fly invasion. Needless to say, he was at least thanking his lucky stars for that zippered lid! Anyway – sometimes necessity can be a real mother! 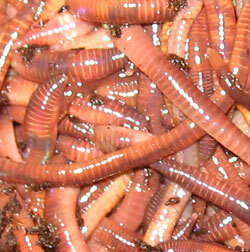 Usually, yes – but this is may not always be the case in the wonderful world of worms. While earthworms are hermaphroditic – that is to say each worm contains both sexes – this actually doesn’t stop them from mating most of the time. After all, genetic diversity tends to be an advantage for most species over the long-haul. You know…’survival of the fittest’, and all that jazz. Thankfully our family stomach bug seems to have “bugged off”, so you’ll be seeing a tad more action on the blog this week! To kick things off, I decided to check up on my TTTWC bins yesterday. Getting straight to the point – I was a wee bit shocked by what I found…or rather, by what I DIDN’T find! Here we are, not even a month in, and one of my bins seems to be devoid or worms! I have absolutely no idea what might have happened. Just to make sure the worms weren’t in fact hiding, I will do at least one more check. Anyway – other than that, everything looked basically the same. The worms in the other two bins did look bigger, and may in fact be adults – but there still aren’t any cocoons to be found. Interested to know if anyone else has found cocoons yet! Be sure to let me know in the comments section below! I have created a Tiny Tub Challenge Guide and a TTTWC Email List to help keep everyone a bit more organized (I know this project kinda got off on the wrong foot – lol). If you are a participant, or just generally interested in following along, I highly recommend at least getting signed up for the list. I decided to check up on my Tiny Tub Challenge bins today. This actually the second time I’ve checked up on them. Last week I had a quick look and added some frozen (once rotten) mushrooms to each bin for food. Everything seems to be coming along nicely in the bins. I am seeing a bit more of an ecosystem developing. Today I saw a few springtails, LOADS of nematodes, some fungal growth, and even some fungus gnats (in one of the bins). Just before the holidays, George Mingin and I had a small (Worm Farming Alliance) test launch for our new worm growing guide. Even though the guide is an “early first edition”, the response was amazing. More than a few members seemed eager to start implementing George’s growing methods right away. One such person was Scott Neitzke, who sent me an email not long after that to let me know about a new worm growing set-up he had built for himself. Hi Bentley, I mentioned I was starting a project based off of your and George’s project. My goal is make a heated box that contains 2 18-gallon Rubbermaid roughnecks that can be kept at a near constancy of 77 F (25 C) the way George does with his Red Word breeding.